I am looking for the Surname of Warrington. in my 1820 census of New Milford CT. There was and Orange Warrington he was the head of house hold son Levi Warrington whom went into the Army January of 1820 he had 3 sisters whom would have changed there names through marriage and they were farmers. Thank You. Looking for death dates and burial for the following: Edwin Cooper Pomeroy b. 27Nov1877 and his wife Alice M. (Mosher) Pomeroy. They were of New Milford as late as 1940's. Thank you. I am attempting to find information on a Peter Randall Bradshaw who was born in New Milford,CT in 1780. Would be interested in communicating with anyone on this person. Seeking data on the VIDETO family (multiple spellings) in New Milford in the 1700's. The online Congregational Church baptisms on this site produced 1 record- thank you! An ancestor, Bennajah, Benajah Bennet/ Bennit married Zerviah Crane of Lebanon on 1 Oct 1769 in Lebanon. I suspect that Bennajah is from New Milford and is related to Isaac Bennit of New Milford. Would anybody have any information that would shed light on the birthplace and parents of Bennajah? Thank you. Ezekiel Butler and one female (wife) is listed in 1790 census for New Milford . I am looking for information about him/wife. Thank you. I'm researching a former slave named Peter Primus and his wife. Mr & Mrs Primus are buried in paupers graves here in Terryville, CT. The record states that Peter was once sold for 30 bushels of rye. Because the record does not give an actual date of death or other info about him, I'm guessing he died approximately 1865 more or less. Others buried in the same location died during the years from 1860-1871. From something else I read, and I don't remember what it was, Rev. Daniel Boardman's slave that gave the name MaryLand to the farm was named Primus. Could it be the same one??? The location is the former St. Matthews Cemetery on East Plymouth Road in Terryville, also known as East Church or East Plymouth. Locally, it is near and known for Tories Den. I'd really like to know more about Mr. & Mrs. Primus. As a former slave, local records do not have more information. Those that were not slaves are far easier to research. Mary Land: Originally; the name was applied to the Rev. Daniel Boardman’s farm at Boardman’s Bridge, on the east side of the river. Mr. Boardman held a slave who was brought from the state of Maryland, and the slave gave the name to the place. Trying to locate any information on Sheldon Camp - born about 1815 in CT, living in 1860 in Roxbury, Litchfield, CT. Sheldon was baptized at the First Congregational Church in New Milford in1828. Married to Lucy Gaylord Camp - born about 1814. They were married 14 October 1838 New Milford, CT., by N. Porter. (Children: Oliver Camp, Albert Camp, Jay Camp, Mary E Camp, David C Camp, Cornelia A Camp, Ellen Camp, Charlotte E Camp, Robert Camp, Charles H Camp, Sheldon Camp). Thank you. I'm searching for any information relative to the family of Mr. Arnold Alfred Johnson. I was removed from this family along with sibs sometime around 1958 and know very little. He was my biological father and passed on in the mid-sixties. Have been trying for years to find the father of Reuben Bronson/Brownson. He was born 7 Sep 1781 in Vermont. Then moved on the CT and then to OH and then to IN. He was the father of 12 children, 8 sons and 4 daughters. I have all the information down and much above. Just that gap in between and Reuben fits there. Any information would be greatly appreciated. Thanks. There was a famous racecar driver who competed in the Indy 500 named Ray Gilhooly. He is listed as dying in New Milford, CT Sept 18, 1973. I am interested in knowing where his grave is and any other information about his life in New Milford. Thank you. I am researching my ancestors and need the following information. If anyone can help please reply to e-mail listed below. John Richmond Born 12 Jan 1842 New Milford, Litchfield, Connecticut Parents: Ephriam Richmond & Annis Oviatt. In search of information regarding Rev. Beach of Newtown , as listed in the following article. I am interested in knowing if he is the same person as: Deacon John BEACH One of the founders of Goshen, Connecticut, erected one of the largest houses in the section now known as East Goshen. If not, any pertinent information regarding Rev. BEACH would be appreciated. "The next religious society in the order of time is the Episcopalian. Some individuals of that profession came into this town at an earlier period, but no stated worship was held here till somewhere between the years 1740 and 1745. Worship was then carried on here by the Rev. Beach of Newtown. One Mr. Barzillai Dean read service here for several years, then went to England for orders, with a view to settle here on his return, but died on his passage. The first Episcopal minister who came and resided in this town, was the Rev. Solomon Palmer from Cornwall. He came in the year 1754, and removed to Litchfield about the year 1760; was minister here about six years. The second was the Rev. Thomas Davis from Washington. He came here about the year 1761, and died in this town May 12th, 1766, in the 30th year of his age, and the sixth year of his ministry." I am writing to you from California...I was born and raised in New Bedford MA...My Great Grandmother on my Mom's side was Sarah Jennette Buckingham, the information I have is that she was born in New Milford CT on 7 Mar 1840 to Orrin Buckingham and Harriet E. Ellis. She was married to Henry W. Dyer and were parents to my Grandfather Norman Saxton Dyer. My information also says that she died on 10 April 1912. Can you verify any of this and can you point me in the right direction for more information on Sarah and her Family. Thank You so much. Recently the enclosed photograph came into my possession. Considering I'm in Wellington, New Zealand means the photo has been on quite a journey. On the back of the photo is written: :"George T. Soule, New Milford, CT". 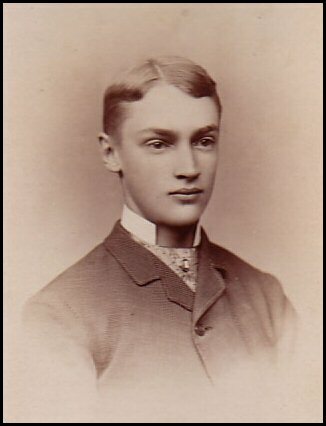 It appears that it was taken in 1882 by a Boston photographer. If anyone knows anything more or are related it would be great to hear from you. James Noble b. 1788 Milford, New Haven Co. CT. md Keziah Northrup b. 1787 New Milford, Litchfield Co. CT on 13 Nov. 1808 New Milford, Litchfield Co., CT. I have not been able to verify these dates or find out the parents of James Noble. I do have the line going back for Keziah Northrup. Any help would be appreciated. Thanks so much for any consideration. I am looking for any marriage information of William Imus to Lucy Buck (or Lucy Hurd), about 1770 in New Milford, Litchfield, CT. Any information you could give would be helpful. Thank you. I am wondering if you have the records of Roxbury, CT North Old Cemetery. I am looking for the Silas Richmond that died in New Milford as well as Ephraim Richmond who I was told is buried in Roxbury. CT. I am trying to find copies of the pages of the books they would be listed in. I live in Washington State. Ephraim Richmond two sons are buried in Center Cemetery on your New Milford, CT site. I am trying to find the grandfather as well as their father. I am trying to prove that Lucy Hawes (b. Dec 23, 1788 and died July 8 1872 who married Daniel Clark) is the daughter of Samuel Hawes b.1752 Revolutionary War soldier who was the son of Isaac Hawes b 1703). Daniel and Lucy Hawes Clark had a daughter Lucina Hawes Clark and was born in New Milford. Would there be a record of Lucina Hawes Clark in New Milford. She was born Dec 9 1827 and died Sept 14 1887. Thank You. I am looking for information on Stephen Ferriss who was born 1729 in Kilkenny, Ireland. Stephen married Sarah Drinkwater. He would have been my 5th great grandfather on my Fathers' Father's mother's side… (My Great Grandmother). Her name was Ella M. Ferris, daughter of Frank Ferris and Emma Clark. Frank was the son of Chauncey Merrill Ferris, son of John Ferris….who was the son of Stephen Ferriss from Kilkenny, Ireland. After I get to Stephen Ferriss I have nothing. My grandfather claimed that the story passed down that he was kidnapped over in Ireland and forced to work on a ship, and then later escaped when they landed. He also claims that there was a brother that was taken with him??? Any Information would be greatly appreciated. I am looking for an Epenetus B. PLATT born abt. 1777. I do not know who his parents are. He married Eve/Eva ? b. abt. 1782. I do not know her maiden name or parents' names. I believe that Epenetus was a blacksmith. He and Eve are buried in Salisbury Rural Cemetery, Salisbury, Herkimer Co., NY. The names of their known children are: Hannah, Samuel, Anna, John, Mary, George, Nancy, Sophia, Lucinda, and Cornelius. I descend from Sophia. The family appears in the Salisbury, NY area by the 1810 census. Sophia was born in 1819, so if this family was indeed in the New Milford area, chances are that some of the children were born there. Thank you for your help. I am interested in finding out more information about my ancestors from New Milford, and these are the names: FAIRCHILD, JENNINGS, STONE, CAMP, NOBLE, MOREHOUSE, HALL, RISDON. My mother's family that was descended from the Warne family of New MIlford (Printed History of the Wrner family has them to my great grandmother Tamar Arnold who married John Pettes, Daughter of Olive Chafee Arnold wife of Robert, from Tamar Warner Chaffee wife of Nathaniel Bliss Chaffee and daughter of Sally Moroxa Joyce Warner wife of Harmon. Sally's mother was named Tamar and is on the 1810 Census in New Milford. She later married Amasa Wells and is bured in Bradford Co, NY. (1852) The Warner history has an error saying she died at Deacons Wells. Her husband was Deacon Wells per Bradford Co Records. Would anyone have any information on the husband of Tamar Joyce, possibly Stephen Joyce on 1800 Census of New Milford? Any clues as to where to search would be helpful. The middle name Moroxa is interesting and may be a clue. LEWIS, Ida - looking for parents, any other info on Ida Lewis, b. abt 1871 New Milford, CT, m. Stephen Hodlin abt 1890. Many thanks! I am searching for information on Levi Lyman. While in Salt Lake last year I finally discovered he had died in New Milford in l799. He had a 15 year old son Levi who chose Adam Fairchild as his guardian. However the son Levi soon left and in Dutchess Co., NY he married Sarah Cornwall. Does anyone have Levi Sr's wife's name? Where was Levi born? Any and all information greatly appreciated. Hi Linda, I'm looking for the surname: Elwood. Is my Grandmothers Maiden name. She was Sarah Emily Elwood Born 1861 and married to Clifford H. Judson in Oct 2 1914. The only information I have on the Elwood's is they lived on Mine Hill road in New Milford CT. and some might have lived in Brookfield CT. Can anyone help me or point me in the right direction? Thank you. I am looking for James Stephen Stuart, grandson of Lord Charles Stuart Murray and husband of Elizabeth Bull. I am told that his name at one time appeared in town records for transfers of real estate, the earliest date would have been 1766 and the latest date being 1783. I also have information that he was a member of the Episcopal Church. There may also be evidence that he possibly lived in New Fairfield between the years of 1777-1778 and possible records of him in Woodville also. I also have a statement from township clerk of Kent, Jerome F. Gibbs in County of Litchfield, Kent dated August 18, 1835 with a name of Marshall G. Gibbs, Justice of the Peace, stating many inquiries over the Stephen Stuart records or descent. Also some information about a missing box from the office about 25 years before that. I do hope that the information I have provided will help. I am tracing my family tree and it seems that my family may have come from Scotland. My ancestors left such poor records that I am having much trouble finding many of them. Please help this search has been going on for many years and I would like to close it soon. Thank You for your time. I am trying to locate the grave site of Joshua Gaylord KNAPP b. 28 Jan. 1795 d. 8 June 1883 m. Julia (Ferris) KNAPP b. 18 March 1796 d. 9 Sept. 1869 daughter of: Daniel H. and Annis (Bostford) Ferris. Their daughter, Julia Marthelia KNAPP married John SCOTT of Scotland on 16 March 1854 in Catskill, NY. Joshua G. Knapp is the son of Levi and Sarah (Gaylord) KNAPP and brother of Levi Sydney KNAPP Any help would be greatly appreciated. Thank You. HAWLEY I am looking for information on the Ephraim HAWLEY, JR Family of New Milford, CT. Ephraim,Jr, was born about 1714 in New Milford. His parents were Ephraim HAWLEY Sr.,B.1692, in Stratford, Fairfield, CT. and Sarah Curtis. Ephraim Jr.'s wife was Ann CHAPMAN, born about 1717 in Trumbull, Fairfield, CT. Their child, Amos, was born 26 Oct. 1739 in New Milford. They then moved to Woodbury, Litchfield, CT in 1840, where Peter, Richard, Reuben, Ephraim, Ann and Seba were born. Amos and Martin Prindle from New Milford, CT, were orphaned at an early age. Martin was removed to Vermont and lived with a Mr. Merlin. Amos (an ancestor) was removed to Westerloo, New York, and I believe lived with a Mr. Farnsworth. Can you shed any light on whatever happened to Amos? I think he had a son, David, born in 1801. I believe he married a Hannah Kritsinger (Greatsinger) around the town of Utica, NY. Any idea why they went to live with other families in different states? Thank you. Looking for CHAUNCEY/CHANCEY J. TERRILL, his ancestry and his family connections in Conn. He was born someplace in "CT in 1801" (per an 1850 and 1870 Census), married a "Mary ?" from NY, moved to Albany, NY in the 1820s-30s, and had 4 children: 2 sons and 2 daughters. They moved on to Cleveland, OH, where he was in the leather tanning & hide business (a "Moroccan dresser"). From there, he went on to Kewanee, Henry Co. OH, where he died in 1872, and his wife, 2 years later in 1874. He had no known military service. There were many TERRILLs in New Milford, CT, but I can not identify Chauncey's parents or if they even for sure came from New Milford. Any Terrills with a New Milford, CT connection, or some local look-up help would be greatly appreciated. Looking for any information on Jesse Moger and his wife Anna Wooster Moger whom were married on 25 Feb 1773 in New Milford, Litchfield, Ct. Two sons were bon in New Milford; Truman on 18 Oct. 1775, and Sylvester Wooster on 3Feb 1774. Any information on these people would be greatly appreciated. I'm looking for any information on William Knowles, a Quaker, who married Innocent Butts Phillips, and was the father of Arthur Knowles (b. 1743) and Elizabeth Knowles (b. 1741 and who married Aaron Benedict). I am particularly interested in any other children William may have had, as well as any children Arthur had. I am also looking for Gideon Benedict Knowles who was, with two Williams and two Arthurs living in New Milford in 1790. My name is Amy Hunter and I am working on some history for our historical society in Berlin Heights, Ohio. I am hoping maybe you can help me. I recently found two work journals written by my GGG Grandfather Joseph S. Lowry. In the first entry of 1828 he writes that Everton Judson describes a "meeting place" or church that he saw in New Milford CT. He describes exactly with measurements and all. It has 6 huge pillars in the front and is Grecian in style. Do you have any idea if this church still stands today? Or maybe if there are any known photos?? I have a photo of the one my GGG Grandfather built in 1838 here in Ohio and am wondering if they do resemble each other. Everton Judson became the minister in the church at Milan, Ohio. He was born on Dec. 8, 1799 in Woodbury, CT. Thanks. I'm trying to locate any information on the Dan ?, the slave of Mary Roberts who was given his freedom in 1757. Is that something you can help with? Thank you. Rufus C. Bemis born Oct 10 1798, Chester, Hampden, MA, died Aug 16, 1883, Buried Long Mountain, CT. Lived in New Milford. Married Betsey Hallock Aug 05, 1827, in Kent, Litchfield CT. who were her parents? Rufus divorced Betsey and married Mary Ann, who were her parents? What are the names of the children of the marriage of Rufus and Betsey? She later married William Mallory, Aug 09 1846 in Kent, Litchfield CT. Need information on George W. Bemis born Nov. 08 1827 New Milford CT. died May 01, 1906 in East Hamilton, Madison Co. NY. Thank you. I am looking for Burnhams living in New Milford between 1790 and 1840. The names I have are Stephen B. Burnham bn CT 1792 married to Martha L. bn NY 1794. Manley Augustus Burnham bn Litchfield County 1830. Stephen and Martha were living in Thompson, Sullivan County New York in the 1840 and 1850 census. There is a Stephen B. Barnam in the 1820 census in New Milford. Hence the reason I am posting here! Our relative is William Benry Burnham bn March 1818 in New York. Thanks for any help. I am searching for the family of Emeline Jennings &/or her husband Charles Garner. Her obit reads: Emeline Jennings was born at New Milford, CT, April 28, 1817, and married Charles Garner, who survives her, in 1841. In 1850 Charles & Emeline Garner with 2 children (Samuel & Franklin) are found in the census for Trumbull & living with an elderly Mary Hawley. Charles is listed as a hatter. They moved to Winneshiek County, IA, in 1855. Cannot find any records of Emeline Jennings or Charles Garner prior to 1850. Any help would be greatly appreciated. Thank you. Looking for parents for Sarah Hawley born Nov. 3, 1768 in New Milford. Father may be Nathan Hawley and mother may be Sarah Kent. She married Caleb Churchill and settled in Rutland County, VT. Any help would be greatly appreciated. I am trying to locate any information on Joseph Hartwell (b. Aug 20 1728-d. Apr 11, 1818). He was married to Rebecca Sherman (Roger Sherman's sister) on Nov 17, 1749. I am almost positive both Rebecca and Joseph were located in New Milford at this time. I am particularly interested in any military services (esp. revolutionary) related to this couple. Any information is greatly appreciated. Thank you. Charles V. POTTER and Mary E. DASKAM were married in New Milford on December 23, 1858, by Rev. S. J. Stebbins. According to the record Charles was born in New Milford - he was 20 at the time of the marriage, so presumably he was born in 1838. However New Milford apparently has no official record of the birth. I would like to know who his parents were and where they came from. Any help you are able to provide will be gratefully received! Do you know which church Mr. Stebbins served? I was under the impression Mary Daskam was an Episcopalian. I think she is buried in the cemetery near the Episcopal Church (she died in 1875). Have been trying to locate my family who lived in New Milford from approximately 1830 to1850. Thomas Pollock was married to Laura Rush and had the following children: Emily, Robert, Martha and Mary (twins), William George, Rebecca, Ellen and Thomas. We have seen them on the census, but when we went to New Milford to check out town records there was nothing on them. The whole family disappeared from the face of the earth for 20 years. Any help you can give me would be greatly appreciated. Thanks. I am looking for the parents of Amarillis Peet of New Milford. Amarillis married September 5, 1821 Samuel Smith of New Milford (N.M. Vital Records, v 1, p 7). Thank you. Thomas Brownson married Sarah Hickock at the Congregational Church of New Milford in November of 1726. There are times I see the name listed at Hitchcock. I do not have parentage of either of these people, can you help me in this? Looking for date of death for Sarah Ann "Sally" Richmond, born 14 Apr 1782 New Milford, CT, d/o Jonathan Richmond and Amarilles Chambers. Married Reuben Tucker 24 Mar 1799 New Preston, CT.
Would be grateful for information regarding the ancestors of THREE BALDWIN SIBLINGS. MARY and/or POLLY BALDWIN, b. 1774, Litchfield, CT; d. 1815, Ashtabula, Ashtabula County, OH. DANIEL BALDWIN, b. 1781, Litchfield, CT; d. 1860, Ashtabula, Ashtabula County, OH. WILLIAM BALDWIN, b. Bet. 1789 - 1790, Litchfield, CT; d. Abt. 1861, Marshall County, Virginia. Beardsley/Stone: Was Sarah Beardsley, who married Asashel Stone about 1761,the daughter of John Beardsley? If so, who was her mother? Was David Stone her son and who did he marry? He had Amanda, Jerome, Garry, Truman, Temperance and Aurilla. Aurilla married John Judd in 1829. Any information on these families would be most appreciated. Thanks. The reference above is from a D.A.R. application for someone joining under the above mentioned Abraham TAYLOR (b. 17 May 1765 at New Milford, Litchfield Co., CT, son of Daniel TAYLOR and Abigail ?ELLIOTT). I can't tell from the application if the Vital Record reference is for Nathan Taylor or for his father Abraham Taylor. I'm hoping it's Nathan because I've had a horrible time finding records on this guy and I'm trying to find records to actually prove my line through Nathan Taylor to his father Abraham Taylor. Thanks for any help! Daniel Taylor, b. 1735, d. abt 10 May 1805, probably in or around New Milford, Litchfield Co., CT. His will was recorded in New Milford 25 Jan 1803 (I have a copy of it) and was exhibited there 13 Jan 1805. His wife's name was Abigail (?Elliott). I'm trying to locate a death record for Daniel. Abraham Taylor, b. 17 May 1765 in New Milford Twp., Litchfield Co., CT; d. 9 Jun 1839 in Bradford Co, PA. His wife was Mary Stone (dtr of Ithiel Stone and Martha Baldwin), b. 28 Dec 1765 in New Milford, d. 8 Nov 1836 in Stevensville, Bradford Co., PA. They were married 30 Mar 1786 in New Milford, CT. I'd like to find a birth record for both Abraham and Mary, and a marriage record for them and haven't had any luck so far. The other children I have listed for Abraham and Mary Taylor are Thomas Taylor, Nathanial Taylor (called Nathanial Taylor Jr. in Daniel's will), Nathan Elliot Taylor, Eunice Taylor, Luana Taylor, and Elizabeth Taylor. Abraham Taylor's line supposedly goes back to John Taylor (m. Rhoda Tinker), one of the founders of Windsor, CT. I'm trying to prove the Taylor line back from Abraham and am having trouble locating records. Thanks in advance for any help! If anyone is related to this line, I'll gladly share what information I have to date. I am trying to piece together my family's history. Andrew Burr Phillips was my great grandfather and was born in New Milford. He married Margaret Behan and they lived in New Milford on Grove St. They are mentioned in H. Peck's book on the history of New Milford. Who can I contact to get more information on the family? Is Mr. Peck still alive? He personally knew the family, so I was hoping that there would be more information available or that he would be able to remember. There is supposed to be a connection to the "local Indian tribe", which I presume is the Schaghticoke tribe. My grandmother, Grace, married Harry (Henry) Taylor. We have very little info on him. Thanks for any info you can give me. I am looking for information on the families of John GAY and Elizabeth COLVER (CULLVER) who were married in Litchfield, CT in 1721. John was born in Dedham, MA in 1792 and Elizabeth was born in Lebanon, CT in 1787. They raised 11 children in Litchfield. Their son, John nee 1726 married Mercy BAILEY. They were married in Sharon, Litchfield, CT in 1754. I need information regarding Solomon Cole who was born at Eastham, Barnstable Co., Mass in 1742 and was residing at New Milford, CT in 1790. He would have come to New Milford from New York State with his brother Nathaniel and perhaps other members of his family prior to, or about 1770. He was the son of Silvanus and Priscilla (Walker) Cole and had brothers Silvanus, Jr., Nathaniel, Barnabus and Andrew and one sister Hannah. I see that I have already put a query into the site in 2002 for any information on Nathan Bryan of Milford. After selling his house in North Milford in 1775, he moved to New Milford. I can't imagine that he just dropped off the face of the earth. His uncle Alexander was a noted cabinet maker in Newtown as well as Alexander's son. If you have any clue as to his whereabouts please contact us. Could you if you can tell me, when was Rt.67 put in from New Milford to Bridgewater. Also the scenic over look between both towns ??? Thank you. Does anyone have any info on Lewis Wilkinson/Sarah Terrill/Hubbard of New Milford? Thanks ahead for any information available on my 6th gr-grandparents. Looking for ancestry of Walter Smith, born 1653 and died May 25, 1709. He married Rebecca Prime April 1, 1677 in Milford, CT. Have traced his descendants but can't trace back any further than Walter. Thanks for your help. Does anyone have any genealogical information on nautical author William McFee who died in New Milford CT in 1966? Thanks for any help that anyone may offer. I sent the following message to Roberta (on the Migrations Page) via your website but received a message stating the e-mail address was not valid. Can anyone help me with the following information? I just found and read your information on Rev. Thomas Lewis and Joanna Booth compiled from Biographical Sketches of the Graduates of Yale College with Annals of the College History, October 1741-May 1745. I have done extensive research looking for the parents of Thomas Lewis married Mary Turrell. I wrote to Yale University and obtained a copy of Dexter, Yale Biographies and Annals 1701-1745. This biography on Rev. Thomas Lewis list his children but does not list Thomas as one of his sons. Does your source list Thomas as his son. If so, can you tell me where I can obtain a copy of this document? I have been researching the Lewis family for over 10 years but stopped looking for Thomas' parents when the biography I received did not list him as the son of Rev. Thomas Lewis. A source that I have lists Thomas as a descendant of George Lewis and Sarah Jenkins from England but so far I have not been able to make the connection. Would someone kindly tell me who Helen Marx is (was)? A park was named after her. I'm not sure of the road, but it is past Young's Field on the left in New Milford. I'm just trying to figure out why a park would be named in her honor, when I cannot seem to find out who she was. Thank you in advance. Looking for ancestors of Phoebe Winters and Ashbell Peet. Phoebe was married to Ashbell Peet in 1823 in New Milford Connecticut. They had a son Amonson Peet born in New Milford CT. Amonson married (I don't know who) having a son George William Peet born in New Milford and died in New Preston Connecticut. George married Jennie Smith from New Preston CT. They had many children one of which was my grandfather Hiram Duel Peet. Hiram married Esther Brown Underhill from Bethel Connecticut. I have traced the census records back to 1860. I show James and Bridget MORRISSEY living in New Milford, CT in 1860 with children, John (my great-grandfather at the age of 6), James, Mary and William. I show James and Bridget still living there (MORRISEY) in 1900, with son James. They were older then (78/62), so I am thinking they were buried in New Milford. How can I find out if or where they were buried in New Milford? If I can find out when they died, I can request death certificates. John and his wife, Mary (Lynch) lived in Waterbury in 1910, with children: Charles (my grandfather), George, Francis and Harold, and in 1920 Mary was the head of household as a widower. I have been to Mary's grave in Waterbury - she is buried with her children, but her husband John is not there. I'm thinking he may have been buried in New Milford with his parents JAMES and BRIDGET. Anything you can tell me would help. Thank you. I am searching for info about NORMAN B. BALDWIN (b. Aug. 23, 1824)son of DANIEL (b.Nov. 20, 1786, Northville Village, New Milford, CT) AND SUSAN BALDWIN. I am also looking for info on NORMAN B. 'S wife,CAROLINE AMBLER. I have photos of her and her parents but know nothing of them, not even their names. Thank you for any help you can give. I am seeking information about Caroline E. Roberts. Last known where abouts is New Milford CT as stated on a deed for property in Boston. . .
She acquired the Boston property from the estate of Alice M. Roberts. Relationship is listed as sister by adoption in the probate records. The death certificate for Alice M. Roberts, February 21, 1942, lists Caroline Roberts, niece. Thank you in advance for you help. I look forward to hearing from you. I am researching the family of Adeline Tucker Brown mother of Elizabeth Brown Underhill Bray. I understand that they lived in the New Milford, CT area. Please contact me for more family information. I'm hitting one rock wall after another and looking for anyone who might be able to help. I'm researching the Samuel Allen family of Pittstown/Hoosick, Rensselaer Co, NY and his descendents through his 16 children. Apparently some of these children have links with New Milford, Litchfield Co, CT. I am very interested in corresponding with people knowledgeable/interested in any of these families. My source data on these particular lines is primarily through the Ritchie Collection in Saratoga Historical Society Library in Ballston Spa, NY...I have not yet done much primary sourcing on the information below except as noted. Samuel Allen m. Sarah Shepard Hammond about 1766 and moved (prob from Dutchess Co, NY) to Pittstown/Hoosick, Rensselaer Co, NY. They had a family of 16 children. Samuel died in 1816; I have transcribed and posted online his will, which mentions his children. His daughters (excepting Phoebe) were married by that time and mentioned by their married names: Ruth Swift, Sarah Rose, Martha Tallman. He left the farm to his twin sons Henry and Ethan Allen and their elder brother Isaac. Isaac died in 1819 intestate. Jabez and Ruth Swift bought out the brother's interest in the farm in about 1821. Jabez and Ruth are listed there in the 1820 Census, but by 1830 had moved to Milton, Saratoga Co, NY. They disappear after that. 1824) and Sarah Elizabeth Allen (born ca 1826) lived and died in New Milford. George Minor married Dorothy Jeanette Crane. He lived/died in the New Milford area and raised four children there. Sarah Elizabeth Allen married Irwin B. Gaylord and died in Gaylordsville at age 22; she is buried in the cemetery there. I do not know where George Allen is buried, nor do I know anything more about these families, Hettie's family, or that of her children. I have a suspicion that the Jabez Swift who married Ruth Allen was also from Litchfield Co. There are Swifts by that name there, but I cannot find the linkage. Ethan Allen, Henry's brother, is said to have married a Sophia Montgomery, but there my info comes to a screeching halt! I have tracked many of Samuel's 16 children, but am grabbing at straws for Ethan Allen, John Allen, Sophia Montgomery, Martha Tallman, Sarah Rose, Thomas Allen. If any of these names or this family rings familiar place contact me! Very little of the information above is confirmed by primary sources, most of it is drawn from the Ritchie Collection in the Saratoga Historical Society Library. I would be most interested in corresponding with anyone interested or knowledgeable about the Terrill, Allen, or related families. My research interest is primarily the Allen Family of Pittstown/Hoosick... and tracking their brood of 16 children. Does anyone know anything about Shubal SMITH born in 1775 from New Milford, Litchfield County, CT. Shubal Smith is my wife's 3X great grandfather who moved to Ontario County, NY in 1795. Shubal's oldest daughter, who left home in the 1820's, said he was born in CT, in 1850 census Shubal says he was born in PA. A relative says he was born in Wyoming, MA but there is no such place. I am thinking Wyoming Valley, PA with the Connecticut Yankees. Was Litchfield County, CT extending into Pennsylvania in 1775 with land claims by the Susquehanna Company in Connecticut? Was New Milford, PA founded when that area was a Connecticut claim? Our Shubal Smith b. 1775 was from CT/PA some where. New Milford has a Shubal Smith born 1775. There is also a New Milford Township in PA. I read in History of Bradford County, PA that Col. Pickering from Pennamite and Revolutionary War days was chosen to be clerk of the orphan's court, recorder of deeds, register of wills in 1787 after the skirmishes and massacres of Connecticut settlers in the Wyoming Valley. Do you know where those records are? Did Connecticut keep track of the land deeds of the Susquehanna Company? Did New Milford's Shubal have any siblings? I have been doing the genealogy of my family for over 10- years. thomas pollock and laura rush, thomas b abt 1807 and laura 1813. they lived in new milford with their children, emily,robert,,william , twins martha and mary, george,rebecca, ellen. found them in 1830 and 40 and 50 new milford census. thomas was a hatter. we found some of his children from the civil war and that states bridgewater. the trouble is we cant find anything else in new milford ct about them you would think with eight children we would be able to find them on other sources, churches etc.. thomas so the census says was born in canada and laura in natick mass, but it may be vermont , other records and findings suggest that. can anyone help? My info suggests that a Alsemina PEET who was married Isaac Caldwell in Sandgate, VT Congregational Church in 1789, was somehow related to either Elijah PEET or some other PEET from New Milford. Any help in how and when they migrated would be greatly appreciated. Thank you. I am searching for any information on Mary Lewis. She was born in New Milford, CT in 1824. She married Felix Katan(Catan). I believe she had a brother Abner Lewis, married to a woman named Adelaid, last name unknown. They resided in Bridgewater, Litchfield Co, CT. Abner Lewis was born in 1837 in New Milford, CT... believe they are children of Abner Lewis and Chloe Fisher. Abner Lewis and Chloe Fisher also had other children: total list of children that I know about are: Mary b. 1824, Charlotte, b.1830, Cornelia b.1836, Abner Jr.b.1837. Mary Lewis and Felix Katan also had a daughter named Chloe. thanks so much!! I have an ancestor, Hermon Fairchild, who married a Jennings. He was born in New Milford, Litchfield Co., CT in 1775. Died in Oswego, NY @1832. Looking for his record of marriage and anything else... Thanks! I am looking for the marriage record of Caroline Lewis and Orlando Morgan. Caroline was born in New Milford to Chloe Fisher and Abner Lewis about 1834. She married Orlando Morgan, I believe in New Milford. I do not know where Orlando is from but he was born in 1829.